1. Captivity, Immurement, Imprisonment, Incarceration : قید - اسیری : (noun) the state of being imprisoned. Halat : State : the way something is with respect to its main attributes. "Narrate me the state of your heart"
Riasat : State : a politically organized body of people under a single government. "The state has elected a new president"
Hukumat : State : the group of people comprising the government of a sovereign state. "The state has lowered its income tax"
Mulk : State : the territory occupied by a nation. "I had to leave the country"
Suba : State : the territory occupied by one of the constituent administrative districts of a nation. "His state is in the deep south"
Samnay Rakhna : State : put before. "I submit to you that the accused is guilty"
How this page explains Asiri ? We help you understand the word Asiri in English. 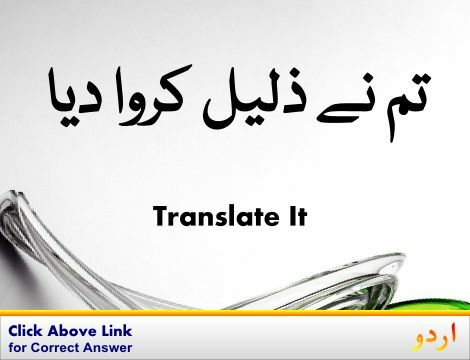 We not only provide English meaning of اسیری but also give extensive definition in English language. You can also find multiple synonyms or similar words along with Asiri. You may also want to see Android app to get اسیری, please install Wordinn Urdu Android app now.